Thursday March 14 1907 Will churned for me some as he ate breakfast. I got the ironing done a little after ten and other work done and dinner ready by twelve so I ate dinner and went to town at 12.37. I did some errand called on old Mrs Ringland on my way over the river. Stopped to see Fannie a little while she is sick in bed. Spent the rest of the afternoon up home coming home at 5.20. Friday March 15 1907 I got my morning done and dinner on the way. Aunt Emma and Ethel came out at 10.20. They did not go home till nearly five. We had such a good visit I did the regular evening work. Was tired and went to bed early. 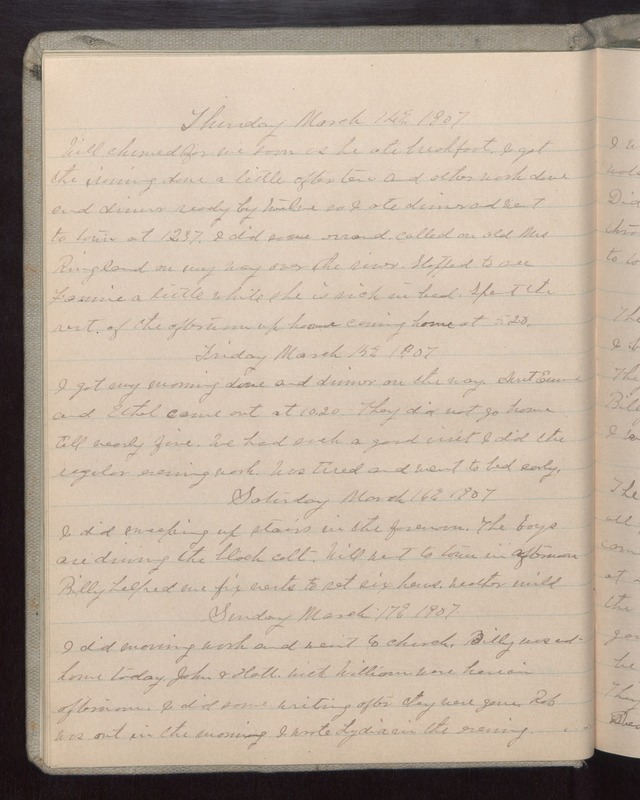 Saturday March 16 1907 I did sweeping up stairs in the forenoon. The boys are driving the black colt. Will went to town in afternoon Billy helped me fix nests to set six hens. Weather mild. Sunday March 17 1907 I did morning work and went to church. Billy was out home today. John & Hattie with William were here in afternoon. I did some writing after they were gone. Rob was out in the morning I wrote Lydia in the evening.